Anguilla is one of the few places in the Eastern Caribbean that, in recent times, went to war with another island... …Well, sort of. In 1967 the British Colonial Office grouped Anguilla together with the islands of St. Kitts and Nevis and made this awkward collection into an independent nation. It was an arrangement that most Anguillans were very unhappy with. Wanting to remain a crown colony they quickly rebelled against the rule of St. Kitts’ Premiere Bradshaw. 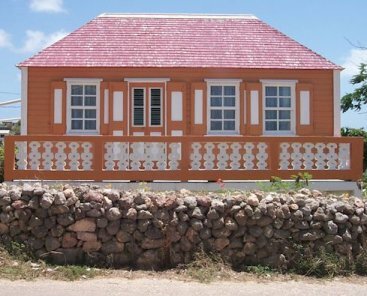 Bradshaw, being somewhat of a pompous hothead, vowed to "turn Anguilla into a dessert." There were even rumored threats to invade Anguilla from the air. (I think they had an old DC3.) The rebels thwarted any attempt at an airborne invasion by parking some old trucks on the runway and then commenced to taking pot shots in the direction of the police station. (The police officers were from St. Kitts.) No one was seriously hurt but the police were completely unnerved. Eventually the conflict escalated into an armed invasion of St. Kitts. A boatload of Anguillan rebels aided by a couple of American mercenaries sailed to St. Kitts and managed to blow a hole in the ground next to the defense force headquarters and engage in a gunfight at the police station. Again there were no casualties. After that no one in St. Kitts wanted to mess with the Anguillans. This standoff lasted for about two years when the government of Britain somehow got the mistaken impression that Anguilla had been taken over by the American Mafia. Once again there was an armed invasion. British commandos were met on a remote Anguillan beach by goats and small boys. After this fiasco the British Government gave the Anguillans what they wanted and returned them to colonial status. Of course there was a party on the beach with as much Caribbean ambience as anyone could wish. At the time of the finish the revelry was at its highest. Out of thirteen starters only four were left with the first two boats neck and neck. To the chagrin of any America’s Cup committee member the spectator boats were out of control. They buzzed around the two finishers like flies. Sometimes even cutting in front of the competitors. The band on the beach was at its loudest as the whole melee passed about one hundred yards astern of the anchored Bellatrix. Linda and I sat in the cockpit and watched as "Satellite" pulled a tactical coup on "UFO" and took over the lead in the last quarter-mile of the race. Today Anguilla is known for its exclusive, up-scale resorts. With rooms starting around $600 a day the most economical way to visit is, as Linda and I have done, on a private yacht. 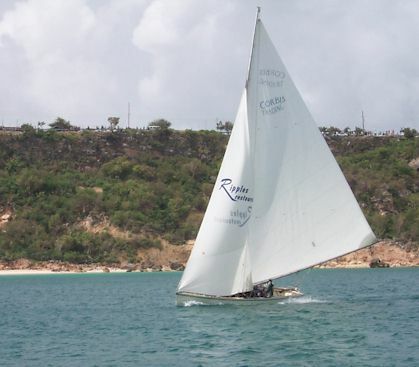 The day after the party at Road Bay we sailed to Crocus Bay, one of the most peaceful anchorages in the Caribbean. To the north is Little Bay where, because of its protected status, no one is allowed to anchor. However, Little Bay is easily accessible by dinghy. Tropic Birds nest in crevices in the cliff face and when they fly over you in your dinghy the reflection of the water make their pure white feathers appear a pale blue. 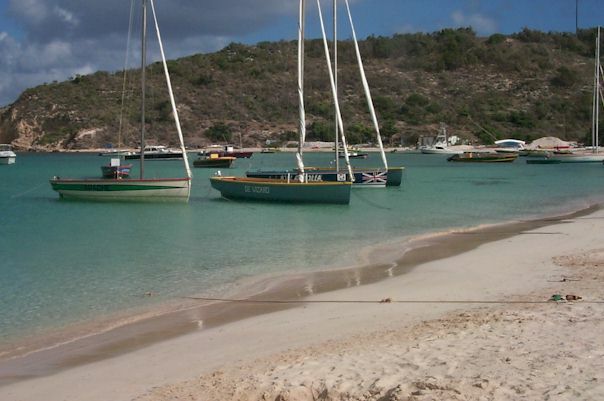 We discovered that Crocus Bay was the ideal place to while away the time before returning to St. Martin. 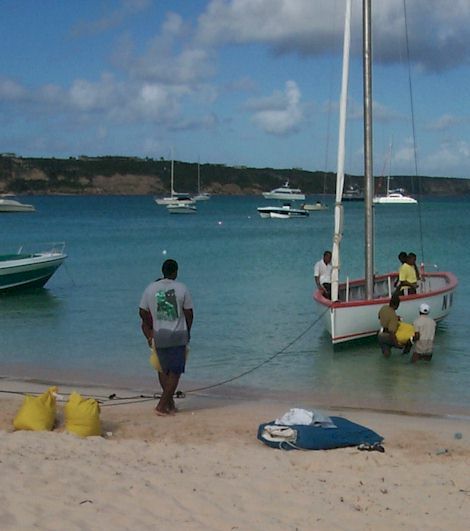 We were able to dinghy ashore and walk about a mile into the town of "The Valley" which is the major commercial center of Anguilla. This gave us access to shopping and other services including Internet access. In spite of the closeness to the town, however the anchorage remained an isolated and peaceful place. On the beach is a bar-restaurant with a "if only the walls could talk" character called Roy’s Place. In addition to the ambience, the beer, and dinner they even agreed to let us have our mail delivered there. We’ll have fond memories of our visit to Anguilla and the time we spent with the locals, both ex-patriot and natives. Much can be said about this island but I’ll sum it by saying that it’s a place that presents itself to you just as it is. No effort is made to construct a façade to give visitors a false impression. The Anguillans are proud of their Island just as it is and have demonstrated that they are willing to fight for it.